A Perth bar has been blasted for enforcing a uniform change on female staff. Amplifier Capitol told female staff members via Facebook they were no longer able to wear a men’s shirt while working at the bar. An Amplifier staff member posted images of both shirts, with the women’s option sporting a low-cut neckline. 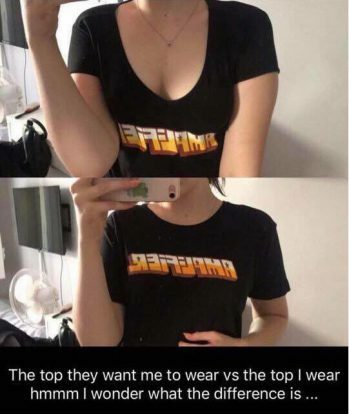 “Forcing female staff members to wear low cut shirts that expose their cleavage while male staff members are not subject to such objectification is blatant sexism and is totally ludicrous,” a staff member in the Facebook group. “We receive enough sexual harassment as it is working in the night club industry and pushing such a ridiculous dress code puts your female employees in DANGER,” she added. After receiving backlash from employees, Amplifier has done a “complete backflip” on the uniform change and will now allow women to wear men’s shirts “as long as they are not overly baggy”. Heaton told the ABC safety was the reason behind the uniform change. “Baggy shirts catch on things and could cause injury in the workplace,” he said. Heaton also told ABC staff members were consulted before the scoop-neck shirt was introduced. However, a former employee denied any conversations regarding the uniform change ever took place. Kill Your Stereo reports two staff members have left their jobs over the incident. In the wake of negative coverage in the press, David Heaton has since released an apologetic statement on the bar’s Facebook account. “I unreservedly apologise for the recent proposed female-only uniform changes at Amplifier Capitol – for the decision, my comments and the manner in which this has been handled. Heaton reiterated that staff are now free to choose which style of shirt they’d like to wear, however the post has already garnered hundreds of comments, with social media users slamming the venue. “It was a throwaway comment that sort of revealed what type of employer you are. You’re only apologising because it went public and you look bad,” reads one comment.